Legislation has traditionally been viewed as a text addressed to and used by lawyers and judges. But with enhanced accessibility via electronic publication of legislation in many Commonwealth jurisdictions, drafters "speak" not only to lawyers and judges, but also to untrained users. This shift of the legislative audience has changed radically the requirements for legislation and its drafting. This is crucially important as the quality of legislation within the Commonwealth remains an essential element of democracy and the rule of law. 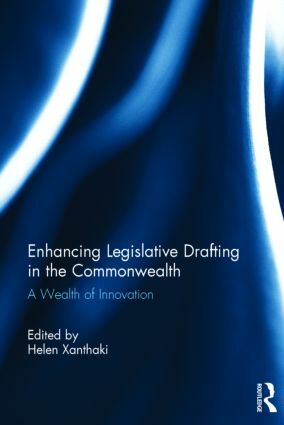 The book aims to alert policy officers, legal officers, law reformers, and drafters of the many innovations in the drafting of legislation within the Commonwealth. And ultimately to bring to light the academic foundations of the modern approach to legislative quality, which really boils down to effectiveness of the legislative product. This book was based on a special issue of Commonwealth Law Bulletin. Helen Xanthaki is Professor of Law and Legislative Drafting at the University of London, and Academic Director of the Sir William Dale Centre for Legislative Studies at the Institute of Advanced Legal Studies of the University of London. She is the Director of the Commonwealth Course in Legislative Drafting, and Co-Director of the LLM in Advanced Legislative Studies via Distance Learning. She teaches legislative drafting at the University of London. She is the editor of the 2014 edition of Thornton’s Legislative Drafting, author of Drafting Legislation: Art and Technology of Rules for Regulation, and numerous articles on legislative drafting, legislative quality, and law reform. Helen is a consultant legislative trainer and drafter, and has worked for the EU, and numerous governments in the Commonwealth and beyond.